In shooting clips outdoors, there are undesired glares and reflections that penetrate camera and reflects on the photograph. Thus, polarizer filters are attached to filter the unwanted light that enters it. They are of two types: linear polarizer filter and circular polarizer filter. Though these have similar effects in usage they differ in the compatibility with camera. The linear filter cannot be utilized on cameras which uses splitting beam optics for metering and auto focus feature, but is used in most digital cameras. Circular polarizer filters have added up optical components which makes them more useful. Circular Polarizer Filter represses the unwanted highlights by darkening sky to highlight clouds. The effect is color saturation improvement as the atmospheric scattering present during the snapshot is suppressed. The digital cameras which have less dynamic range are greatly benefited by utilizing circular polarizer filter, because they can suppress excess contrasts selectively. This means, the pictures are preserved by bringing up shadows and preventing exposure in post processes. 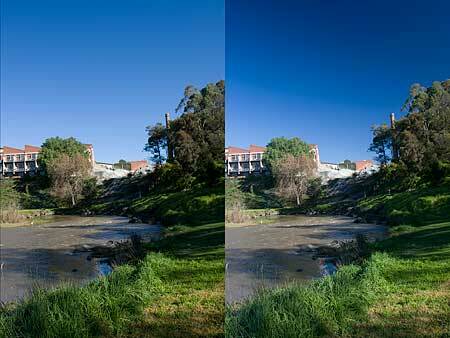 The more the polarizer filter suppresses the highlights, the lower are the problems with shades in the shot picture. This filter is an effective alternate option for favorable digital camera angles for the Sun and the haze control. Importantly, this filter also provides cushion for the more expensive camera lens from scratches and Ultra Violet rays. This filter changes the way the digital camera treats the light, reflections, and the glare so that it could very well enhances the vibrancy of colors. With these good uses, surely we are convinced that we need this polarizer filter for our digital cameras as this can affect the color factor of our shots. For this we should learn to choose a better polarizer filter for the digital cameras. The most ideal option to be used for digital camera with automatic focusing feature is the known circular polarizer filter. We must note the different diameters in the lenses. The larger the diameter of the lens, more the expense of the filter becomes. But make sure whether the polarizer filter fits to the camera lens. The polarizer filter’s efficiency depends mainly on the amount and brightness of sunlight and on the better quality of the polarizer filter present during the time of shoot. Shooting outdoors is a real challenge. If we have the quality circular polarizer filter in hand, we can get rid of a reflection that ruins beauty of the picture. Protect the digital camera lens during the shot capturing by attaching circular polarizer filter to add beauty to the scenario.